There's no cinema-producing country in the world with less of a popular tradition than Portugal, where, year after year, the feature films released are personal and private, experimental and esoteric, and paid for, mostly, with government subsidies. Nobody has made out better than Manoel De Oliviera who, literally since the silent period (that's when he began directing! ), has forged his kind of Portugese movie, without the slightest glance toward what regular audiences want. I'm Going Home, shot in 2000 when Oliviera was a robust 92 (he's maybe 94 now) is typical fare in some ways, i.e., beginning, without any set-up or explanation, deep in a stage production of Eugene Ionesco's Exit the King. A 13-minute sequence from an obscure absurdist drama, and Catharine Deneuve appears here and never again! But then the movie becomes normal (mostly), moving, and wise. It's one of the most accessible, and endearing, movies in Oliviera's seventy-plus years of film directing. Actually, even that cutting from Exit the King, though brazenly indulgent, has resonance for what happens afterward. Ionesco's dottering ruler admits he knows nothing of life, then announces impulsively that he wants everyone in his kingdom to have his image before them. O vanity! 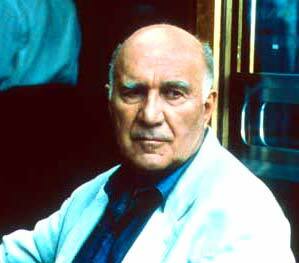 Soon, the morally blind stage character and the actor playing him, Gilbert Valence (Michel Piccoli), separate. As the play-within-a-movie finally ends, Valence walks off stage to be met by three men in street clothes with the worst news: the actor's wife, daughter and son-in-law have been killed in an auto crash. Now, just as the creaky king he inhabited on stage, Valence is faced late in life with how to live his life. Valence, different from the self-vaunting potentate, chooses solitude. Saying "no" to the possibility of romance with a young actress, he lives in an old house, in a bedroom up the stairs, and his only companion is his little grandson, Serge, whose parents were killed in the accident. I'm Going Home, as it unfolds, teaches the opposite value from that espoused by Ionesco's ruler. Pure humility, and what counts in Valence's lived life are the miniscule things: a new pair of shoes, a cup of espresso at his neighborhood bistro, the music of a calliope, the form of a revolving ferris wheel, the Eiffel Tower lit at night, all these captured beautifully, tenderly, by Sabine Lancelin, Oliviera's cinematographer. What also counts is making art, the real kind, the right kind. Oliviera, who has never compromised his own vision, wants the same for Valence, who is seen contentedly on stage playing Prospero in an avant-garde production of The Tempest. But he says "no" again when his eager-beaver agent tries to talk him into a lucrative action TV serial. Valence makes one mistake, allowing himself to be cast in a movie version of Joyce's Ulysses, wooed by an American director, Crawford (John Malkovich). But the film is being shot in English, not easy for the French actor, and it's obvious that he's miscast, under a silly wig, as stately plump Buck Mulligan. That's where the title kicks in, an epiphanic decision: "I'm going home." It's a moment close to the heart of Michel Piccoli, the amazing French actor so simple, so sublime, as Valence. "I think as the world becomes more complex, the more you have to learn to say, 'No,'" Piccoli said at a Cannes 200l press conference, where I'm Going Home was perhaps the best-loved film in competition among the gathered critics. "Valence is a character I found extremely interesting. Am I playing myself in the part? I can't say." "I chose a child I saw for the very first time as his grandson," Oliviera piped in. "I chose Piccoli because he's an actor with a lifetime of experience. I'm more and more excited about a long life of experience. Still, he's a youngster next to me." At that, Oliviera, who honestly looks about 65, laughed uproariously. Piccoli, born in 1925, agreed. "I can't do the math, but I could perhaps be Mr. Oliviera's son." What's so special for Piccoli about acting for Oliviera? "There's a great deal of intimacy and closeness. He is a man who has a kind of diabolic authority and a perverse authority. At the same time he's an enormous joker. How is it that Deneuve and Malkovich accept a part on two days notice? Because they have a loyalty to this mysterious man." A journalist had to ask the obvious: the secret of these spry ancient gentlemen, actor and director, about holding back aging. Piccoli: "I don't want to get old. One has to become more and more radical." Oliviera: "You must ask the Lord in heaven."